Once upon a time, there was a boy. The boy owned a red dog with a curly tail. The dog was one of a kind—a mixed-breed stray found riding the “T” in Boston. This boy loved this dog more than anything in the world. Until the day the boy met the girl. At first, the dog resented the girl for usurping his place in the car (among other places) but after many months, he grew to tolerate her. The trio moved to the suburbs. The dog was unhappy. He was no suburbanite; he was a city dweller. The boy and the girl tried to cheer him up. They got a puppy to keep him company. The dog thought this was a tremendously stupid idea but learned to tolerate the puppy at least as well as he did the girl. Life was good. Time passed. Before they knew it, the boy and the girl grew up. Babies were born, mortgages obtained, promotions earned. Bills were paid, child enrichment programs found, someone started preschool. And the red dog became sick and died. Diapers were changed, family vacations planned, the chimney was replaced. The twelve-year-old puppy passed away in her sleep. Home improvement projects were started, business trips taken, play dates scheduled. Season after season whirled by. Someone started fourth grade. The girl was surprised when she turned the page of her hometown newspaper and found a dog with a curly tail staring out at her. He was advertised as the “pet of the week,” right next to the police blotter and an article about a car colliding with a moose. So surprised was she that she didn’t pause to consider the consequences before sharing the dog’s picture with the boy. The boy and the girl debated the pros and cons of dog ownership for weeks. While they argued, the shelter accidentally burned to the ground. The boy called all the shelters in the surrounding area in hopes of locating the dog. He found him. He had heartworm and lyme disease, but he was alive. The boy and the girl and their three children drove to the middle of nowhere to meet the dog. The girl griped about muddy paw prints, expensive diseases and additional responsibilities for most of the two hour drive. 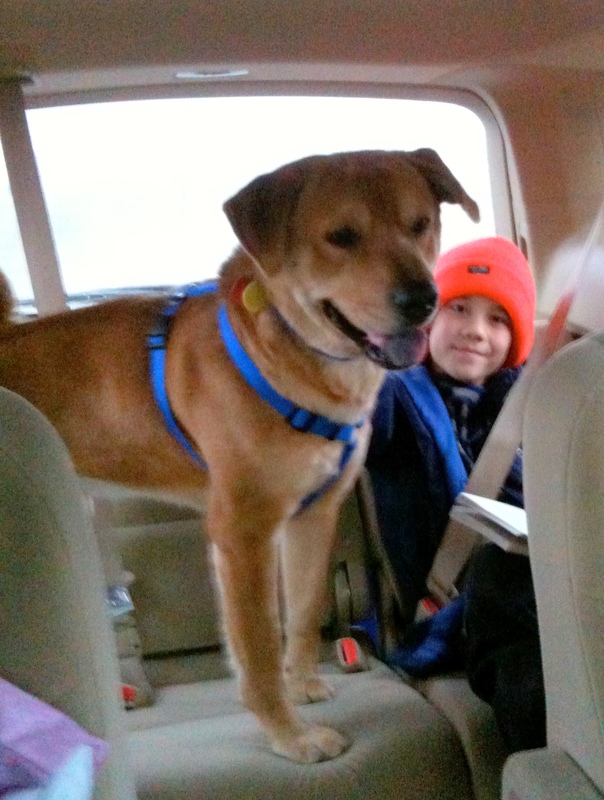 When the shelter’s manager went to retrieve the dog from his kennel, the boy held his breath. The girl steeled herself to dislike him. The kids chased each other around the room like puppies. The dog trotted into the melee with his head held high and his cinnamon bun tail waving from side to side. He was red. An unbelievably familiar red. The girl felt the tears gathering, didn’t trust herself to speak. She looked at the boy and knew it was a done deal. He was in love with a red dog. Again. One of the greatest love stories of all time! We recently became the forever home to a beautiful red dog (with a fluffy tail, a golden.) It was a match made in heaven for us, too. Congrats and Best wishes! Thanks Tina! Congrats on your adoption too! Our puppy was part Golden – she looked and acted like one except she was black. I loved her a lot – still miss her, in fact. Beautiful story Mary! Enjoy your Paco. He looks very happy! This post brought tears to my eyes. Thanks to you guys, Paco now has his forever home. I can’t wait to see and hear more about the new addition.